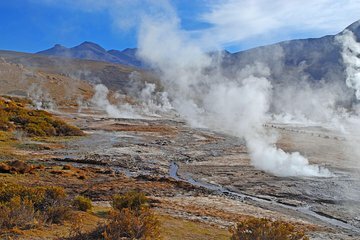 Discover the unearthly geysers of the world’s driest desert on an early morning tour to El Tatio geyser field from San Pedro de Atacama. Gaze in wonder at over 80 spouting shoots of steam as you watch an enchanting sunrise in the desert. Enjoy a traditional breakfast before soothing your bones in the warm waters of natural hot spring. Conclude with a cultural exploration of the provincial village of Machuca on this engaging excursion. Depart from your hotel before dawn and enjoy the desert sunrise during a scenic 2-hour trip north. Arrive at the geyser field as the sun completes its ascent and casts a spectacular glow over one of the biggest geothermal fields in the world. Explore the field for 2 hours, marveling at the impressive white column of steam that tops each geyser, then disappears as the temperature increases. Capture fantastic photographs then enjoy a light breakfast of fresh ham or cheese sandwiches, a sweet biscuit, fruit juice and tea and coffee. Then, soothe your muscles in the warming waters of a natural hot spring. Plunge into the inviting 95°F (35°C) water to combat the 40°F (5°C) temperature outside; change into your bathing suit then enjoy a relaxing 50 minutes in the pool. After 3 hours of enriching exploration, return to your comfortable minivan and venture to the provincial village of Machuca. Explore the tiny village, consisting of only 10 residents, a wooden church and rustic abodes with thatch roofs, browsing charming artisan stores for bespoke souvenirs. Sample the local specialty of a llama empanada (own expense) then settle into your vehicle for the journey back to San Pedro de Atacama. Everything you could expect from the description. Just be aware that, at that altitude and before dawn, the air temp is below zero. The geysers themselves were very interesting but not so exciting as ones that we had seen elsewhere in the world. Overall the tour was a great day out with a super guide who spoke really good English. I would go on it again as we saw some wonderful country. I provided the pick up address 2months in advance, and reconfirmed this and the pick up time 48 hours before the tour. But despite getting up at 03:15 the bus did not turn up. The Chile enquiry number would not answer when we tried 15 mins after the agrred time, until eventually 30 mins later someone answered who was working from home and based in Santiago. They said they could not find the booking snd slso was unable to contact a different local company tgat was actually providing the tour. We shall see what happens now. So far quite unimpressed by losing a day of holiday. The bus was uncomfortable. The geysers were good, but the breakfast was not. The village was disappointing. It is too long and not really worth it for those who have seen Yellowstone park or other geysers. This was a fine tour, and the people contractor Touristour were great. But there was little value added beyond the transit to get to these places, and that's what you're paying for with one exception, which I'll note on that tour's review. Our bus broke down on the way there, so we missed the geysers at dawn. But the company brought substitute transport as soon as possible and was good spirited about it all I can't see blaming them for one of those things that happens. Anyway, though, if you have time and resources to rent a 4WD instead, you would be well advised to do so.